Scenario #1: Your holiday morning is totally relaxed as you reserve your energy for preparing a fancy meal later in the day. You have some toast or cereal for breakfast because it’s fast and easy. Scenario #2: You wake up with lots of energy and are feeling ambitious! You want to make something extra special for your holiday breakfast. If you picked scenario #1, you are excused. 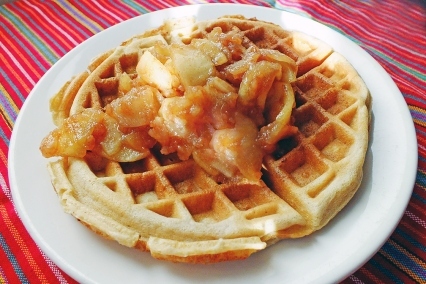 If you picked #2, read on for inspiration for some extra special holiday breakfast food. Bring milk, water, maple syrup, vanilla and pinch of salt to a boil in a large saucepan over medium heat. Stir in the oats and cocoa powder together in a small bowl and add to the milk. Cook, stirring frequently, until the oats are cooked to desired consistency, about 10 minutes. While oats are cooking, slice bananas into thick slices. Pour sugar onto a plate and coat bananas in sugar. Spray a cast iron pan with cooking spray and heat over medium high heat. Add bananas and cook until golden brown underneath, about 4-minutes. Gently flip bananas over, turning heat down to medium. Transfer caramelized banana slices to a plate covered with wax or parchment paper. Transfer cooked oats to bowls and top with the caramelized bananas and hazelnuts and drizzle with a little maple syrup. In a large heavy skillet, cook the bacon until crispy. Set bacon aside. Drain some of the fat if desired but leave in at least 2 tablespoons. Add potatoes to pan; season with salt and pepper. Cook until potatoes are browned, about 10-15 minutes. Whisk together olive oil with vinegar, mustard, and green onions, salt and pepper in a large bowl. Add the arugula but don’t toss yet, and set aside. When the potatoes are browned, transfer to the bowl with arugula and dressing. Toss until coated and divide among 4 plates. Return skillet to stove over medium heat and add the eggs. Cook until whites are almost set, about 1 minute. Cover, turn off heat, and let stand until whites are just set but yolks are soft, about 2 minutes more. Top each salad with a fried egg and two slices of bacon and serve immediately. Place water and sugar in a saucepan and bring to a boil. Crush the cardamom pods and add to the boiling water along with the cinnamon stick; boil for 1 minute. Add milk and bring to a boil again. Remove the pot from the heat. Add tea bags. Cover pan and let the tea steep for a few minutes. Strain tea into a teapot. Beat milk, eggs, sugar, vanilla and salt together. Add the flour and whisk until combined. Heat a 10-inch cast iron skillet over medium-high heat and add 1 tablespoon butter. Once butter has melted pour in half the batter and let cook, undisturbed, until it barely begins to set. Using a metal spatula, scramble the pancake batter and separate it into small pieces, stirring and flipping often until the pieces are nicely browned. Remove onto a plate and repeat with remaining butter and batter. Serve sprinkled with powdered sugar or cinnamon sugar alongside fruit preserves. Heat oven to 375 degrees. Cook bacon in a cast iron pan until crispy. Remove with a slotted spoon and set aside. Pour off bacon fat and reserve for another use. Return pan to medium heat and saute sliced onions, until lightly browned, stirring frequently, about 10 minutes. Remove onions from pan and let cool.